Have you ever read the agreement when you installed software on your computer? I read it once. By signing the agreement, I had to promise not to reverse engineer the software code. I was reminded that I was reverse engineering artwork all the time. Am I being a bad boy? Of course I am taking liberties with terminology. I am really just trying to guess an artist�s intentions, motivations, passions, special methods, and so on. I look at the artwork and speculate about what the artist was thinking. I am empathizing. Of course I am only guessing. Even artists themselves cannot say everything about their own motivations, creative strategies, and so on. By using backward design to teach creativity, we know how we want students to learn to change the ways that they use their minds. We begin with ways to thinking and dispositions we want them to practice. This means we have to find ways to help students generate the right questions, good practice habits, productive ways to respond to mistakes, how to experiment, and so on. I use a kind of �reverse engineering� to plan art lessons. Reverse engineering an artwork allows us to teach creativity instead of imitation. It provides an unlimited source of ideas for classroom questions, experiments, play, practice routines, and so on, for art lessons. This leads to artwork that the students individually invent instead of stuff that is imitated or copied. It is a way to find the strategies for students to learn how to invent content and creation strategies based on their own lives. I am looking for the engineering of the invention process itself. Of course there are many answers to this. Most questions that are worth asking and answering have many answers. We can use and teach this empathic imaginative approach to help our students learn to experiment, discover, practice, design, persist, self-critique, think, feel, and express themselves as artists instead of relying on examples, demonstrations, imitation, or copy work. When I "reverse engineer" another artist's creative process, I am looking for ways to start a lesson that can inspire students to think and create from their own experience, practice, imagine or observe without having to show them the work of the artist before they do their own artwork. I want to steal the thought process--not the look of the work. I am looking for the spark that ignited the artist's imaginative process. If I understand the creative spark and how inspiration can work, it helps me to invent a way to ignite the imagination of students. I do not want to reverse engineer the reproduction of a particular painting, sculpture, or product. I want to backward design the artist's thinking habits, questioning habits, practice habits, and other aspects of artistic thinking and behavior that has produced innovative and evocative work. Empathy requires imagination. We may not realize it, but empathy is an intuitive instinct that allows us to produce artwork that communicates, is evocative, and relevant. I am convinced that empathy determines much of my studio success, and it also allows me to identify with the intentions of other artists. I used to think that art teachers needed to be artists themselves so that they would know how to demonstrate their own production skills. I have now come to realize that I use empathy as part of my imaginative scenarios about how to materialize my visual art ideas. Art teachers who are also experienced as artists may be more able to imagine the secret strategies used to produce great art examples. Keeping these secrets hidden is the opposite of good education. WHEN DO STUDENTS FIND OUT WHERE THE LESSON IDEAS ORIGINATED? After the media work and after the classroom critique, the students get to see and discuss the actual professional artwork used by the teacher to design the lesson strategies. Because they have used the same creativity strategies that may have been used by the artist, they now have a frame of reference from which to understand the artist's motivation and strategies. Advanced students are those who at any age that have become habitually creative and self-motivated autonomous learners. These advanced students will appreciate the value of reverse engineering. They too will be able to conjure up reverse engineering ideas about the work of great artists without being tempted to copy the work to get a quick rip-off of the product. Are you an artist? The next time you see an impressive work of art, try reverse engineering the thinking and practice routines that produced it. Begin to imagine the innovative approaches and strategies the artist must have used. Now imagine yourself, an artist. You bring a whole different set of life experiences. How would you begin? What would you practice? What kind of playing around would you do? What sort of material would you be most qualified to work with? What subject matter would you most likely deal with based on your concerns? Every students has a unique set of life experiences to bring to the act of creation. We are never bored when we actually attain the ability to think creatively. Are you an artist who is also an art teacher? As you view that impressive work of art, you can imagine the questions you could ask your students to get them thinking like this artist? What do your students need to practice? What experiments do they need to do? They do not need to see the work, but they do need motivation, direction, and focus. Can we instill motivation by raising relevant and poignant issues? Can we do this without showing them the work that we used? If we show it to them, they will see it as answer before the bother to solve the problem. As students think, respond, experiment, make discoveries, and gain expertise: their ideas will emerge. We do not need their artwork to have any obvious visual connections to the artwork we use to plan our approaches. We need their artwork to be just as authentically theirs as was the work of the artist we used as a strategic guide. One of our purposes in being an artist is to learn how other people feel and think. Without this ability, we are not successful. Every time we create art, we are empathizing with the viewers. We are trying to guess how they will see it, what it will mean to them, and how it will make them feel. We devise design and composition strategies to make this work. We then discover what works and what fails and the process repeats itself in an infinite loop. One of our purposes in being an art teacher is learn to empathize with our students in order to know how to coach them. In reverse engineering ourselves we understand our own altruism, our instincts, and why we teach. In 2007, it was proposed, with very convincing evidence, that cubism was motivated by the invention of motion pictures about 100 years ago. Glimcher is also a filmmaker and a painter. [Rose] This adds to his ability to empathize and understand the motivations of Picasso and Braque. Some secrets of artistic motivations have taken many years to decipher. For a hundred years the art critics and art historians had not reverse engineered the story behind cubism. We can only guess why Picasso and Braque did not choose to reveal the story of their own inspiration. Artists may realize that their work possesses greater enigma, mystery, and value when they conceal part of its meaning. Mark Twain wrote an autobiography, but publication was forbidden until 100 years after his death. Some of his writings on religion are not to be published until 500 years after his death. My cubism lesson begins with students observing a simple piece of bent wire without looking at the paper as they draw. (Bartel Cubism) I turn the wire and they draw it again without looking at their paper on same paper in the same spot on the paper. This hands-on practice should have no demo and no example for them to see. They each learn to discover as they their work reveals itself to them. When they look at their practice lines, they see overlapping bent wire shapes. No two students are getting the same outcomes, but they are all learning about cubism, without knowing the word �cubism� they are gaining non-discursive visual art effects. A few students may notice the representation of time and motion, but that discussion can wait. Now the lesson becomes more interesting. From a secret hiding place, I often bring out a live animal two. I use chickens, rabbits, and so on. From their practice, they know what to do without demonstrations or examples. I simply tell them to fill their papers with overlapping practice lines that are drawn while looking at the animal. They are reminded not to look at their paper while the drawing hand is moving. Each time the animal moves, they are to begin a new line. I reassure them that these are more practice lines. It is fine for them to overlap and fill the whole sheet. As the papers fill with lines, we can stop and discuss what is happening and what we can learn about the passage of time and about motion by looking at these sheets of paper. Instead of thinking of these papers as pictures, what if we see them as visual recordings of time and motion? As we look at them as designs, what could we do to make them into designs or pictures that would be fun to look at? Students sometimes get good ideas about adding tone, color, texture, or other elaborations. Here I ask students if they can fill their papers with lines. 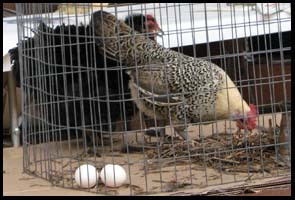 Each time the chickens move, they may begin another overlapping observed line. Their preliminary practice included the use of a blinder and not looking at the drawing paper while the pencil was in motion. Later the chickens circulate around the tables so that children can add details, texture, tone, and so on as they develp thier drawings. Marvin Bartel, visiting artist, funded by a Dekko Foundation education grant. Josette Abrams, art teacher. North Webster Elementary School, 2010. When their artwork is completed (this may take more than one session) students will know how to ask questions? They will have in interest in talking about cubistic examples by the artists who invented cubism 100 or so years ago. Watching a short clip of an old archival film that flickers and jumps could also help them imagine how new ideas in painting emerge in response to what happens in the life of the artist. Instead of seeing art as something to copy, perhaps they will begin to see art as something to move their imaginations. Perhaps they will see art as motivation to empathize with the artist in order to learn new ways of thinking about the worlds in which we live. The pencil drawing here was made in my adult drawing class. 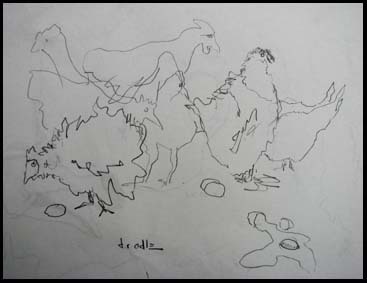 It is a practice observation drawing of two chickens in motion drawn with the instructions to keep drawing in the same space while the chickens are moving. The instructions included the use of a blinder and not looking at the paper while the pencil is in motion. Reverse engineering is common practice in industry among competing companies. When one company or individual invents an innovative product, the research and development department of the other companies reverse engineers the innovation. Creative engineers then improve on it so they can surpass the original invention. It is a common method of legally stealing patented or (using he first invention as starting point to invent actual improvements that are substantially different from the original). One reason for patent law is to protect the invention for a few years (rewarding the inventor), but another very important reason for patent law is to overcome secrecy. Every patent must be published for all to see. You can find out if I or anybody else has any patents by putting my name in Google Patent Search. You also search be topics, dates, and so on. A very important purpose of patent law is to create an open flow of information and knowledge about innovation and minimize the practice of proprietary secrets. This encourages progress. Without the patent law requirement of openness, inventors would keep their innovations secret to avoid copycats. Secrecy would impede progress as it did for thousands of years. An example would be the secret glaze formulas for reduction red and crystalline glazes that were never patented. Those who knew how to produce crystalline glazes demanded high prices for their pottery, but they did not patent the recipes because they were afraid that others would steal their secrets. The Chinese knew how to make beautiful porcelain a thousand years before the Europeans. The Europeans bought the ware and tried to copy it, but for many years were unable to reverse engineer it. The Japanese kidnapped the Korean potters in order to find out how to produce high quality pottery. Of course artwork is not patented, but it is copyright protected as it is made. No registration is required, although registration may make it easier to protect from violation. Copyright does not limit use of the ideas or the concepts shown by a work of art. It only restricts that particular way of rendering the subject, idea, concept, and so on. Ideas and concepts that are in our minds are free. They are part of the commons like the air we breathe. When we express ideas in any form the copyright becomes the property of the person, or group who materialized it. Of course owners may sell or give permission and allow others to make copies. To reverse engineer successful artworks is only an educated guess at best. We are copying any actual work. We are only trying to guess the ideas behind the process. In the case of art, we can legally and ethically obtain thinking strategies by imagining the innovative strategies used by successful artists. We can use the strategies to make new and different renditions when we figure out how an idea has been inspired and developed. One method of being a creative art teacher is to be more competitive in the way we design our lessons to produce more creative minds in our students. Reverse engineering used in this way can foster creativity and help our students become the next generation of innovators. Sources: My doctoral study in art education included courses with Dr. Phil. Dr. Phil Rueschhoff studied with Viktor Lowenfeld, author of Creative and Mental Growth. Dr. Phil had us study all the known research on creativity that we could find. I have come to think of Lowenfeld, who was a contemporary of B. F. Skinner, as the other side of B. F. Skinner's brain. Our Dr. Phil introduced us to the notion of teaching art by beginning with creativity building activities and ending the art-learning units by having our students study the historic artistic sources of our strategic thinking strategies. Bartel, M. (2001) Cubism from Scratch. Pink, D. H. (2009) Drive: The Surprising Truth About What Motivates Us. Penquin Group, New York, Pink explains that autonomy, mastery, and purpose are the three most powerful human motivators. Rueschhoff, Phil H. & Swartz, M. E. (1969) Teaching Art in the Elementary School: Enhancing Visual Perception. 1969. The Ronald Press Company, New York, NY, U. S. A. ISBN: 0471068799 , 339 pgs. NOTE: The author studied with Rueschhoff who championed the idea of delaying the art exemplar until the end of each learning episode. He had students begin the learning episode with hands-on sensory sorting practice to build a better frame of reference for the study of the exemplar at the end of the episode. He used value scales, scent samples, texture sets, tastes, and so forth to build greater awareness. His students did hands-on collecting, sorting, composing, and so on; before they studied the artwork exemplars that offered similar accomplishments that had been produced by great artists. It is easy for this happen. For an art teacher who may be feeling a bit burned out, visiting an art museum and reverse engineering can turn into a whole new approach that can keep ideas flowing for many more works. Students also get burned out and may benefit from chances to imagine, practice, and discover the mental processes of invention (not copying) from another artist. They can try to imitate similar inspirational strategies, idea generation strategies, refinement strategies, and so on while making artwork that is true to their own experiences, passions, imaginations, and abilities. Students may need time to review the invention process and discuss how reverse engineering works. It should always be our goal to make students become independent learners before they leave our classroom at the end of the term with us. If we train them to copy, we have encouraged a form of "learned helplessness." You are invited to link this page from your web site.